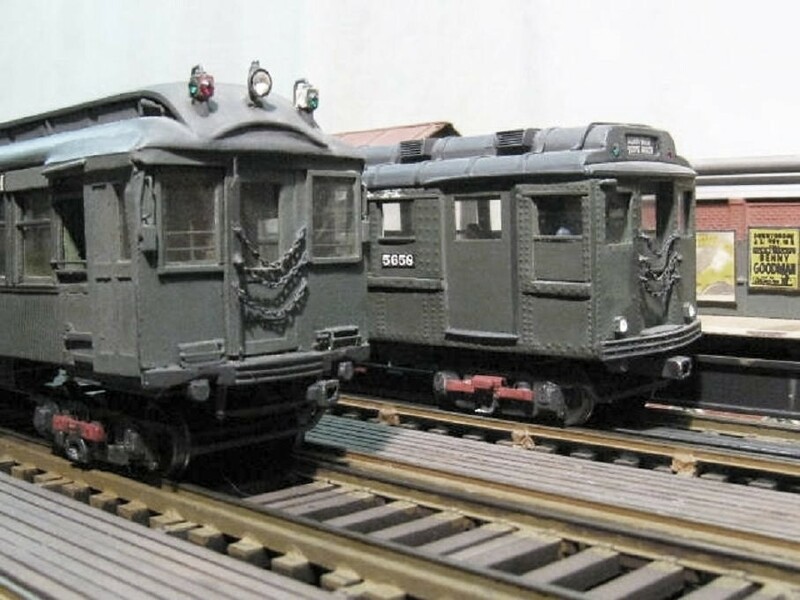 (*) - These were 25 two-car sets built for IRT service on the (Queens, New York) route to the New York Worlds Fair of 1939-40) and could be mated ONLY with IRT standard Low-V Body Steinway Motors. 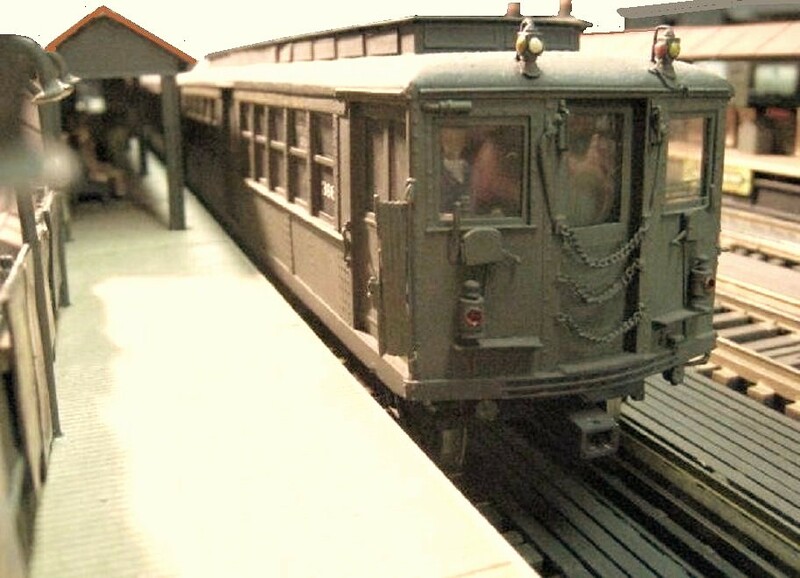 Rear of last car of local train - a Gibbs Hi-V Motor - seen pulling out of local EL station near end of the platform. 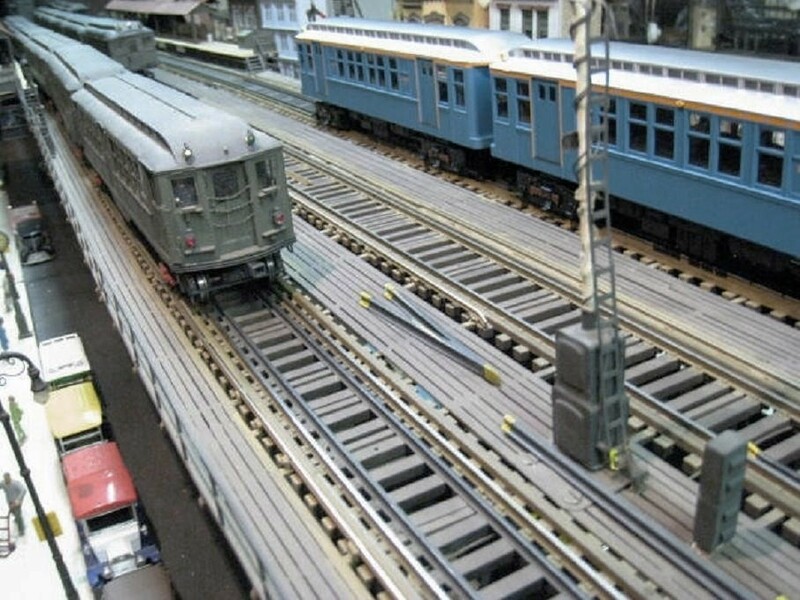 Head-on view of an IRT "Gibbs" Hi-V Motor car with Manually operated Door controls - seen at left at head of local train at an island platform terminal station, with at right, a train of new IRT R-17 cars, which by 1959, replaced all the IRT Hi-V Car fleets. 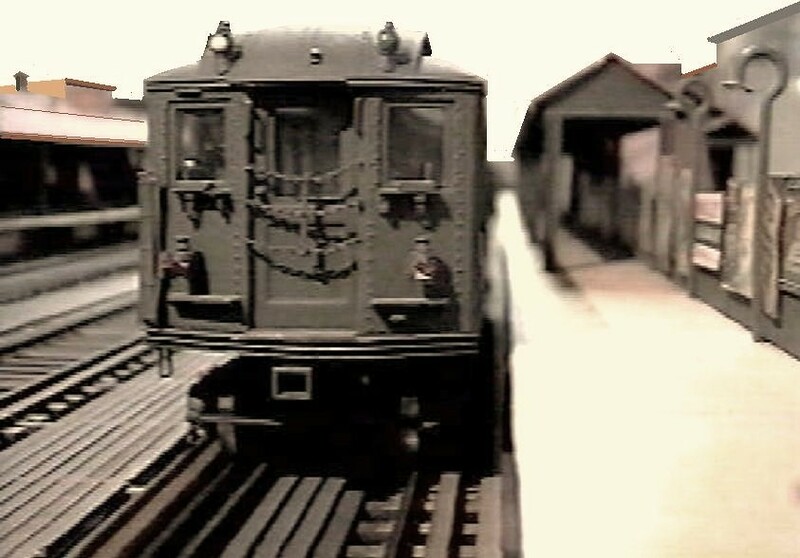 This view seen from the motorman cab of an express train on the EL shows a 3/4 view of an IRT Steel "Gibbs" Hi-V Motor Car with manually operated door controls as it brings up rear of a local train taking the curve for a diverging route on the EL in the same direction. 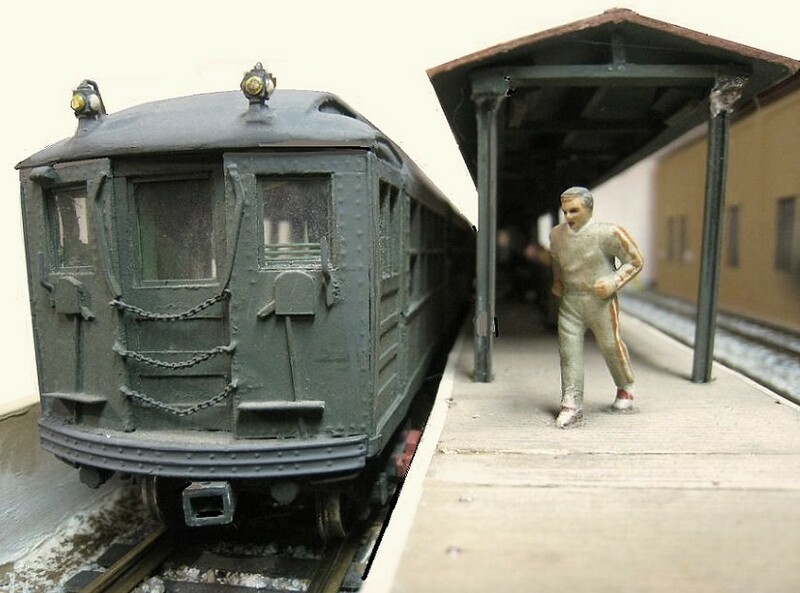 IRT Steel subway "Gibbs" HI-V motor car seen at left, and IRT Hi-V Headley Motor Car at right seen at terminal station platform. IRT Steel Deck-Roof Hi-V Motor # 3662 seen with motorman in his cab at head of train in a terminal station track adjacent to a layup yard on the EL, awaiting train departure. 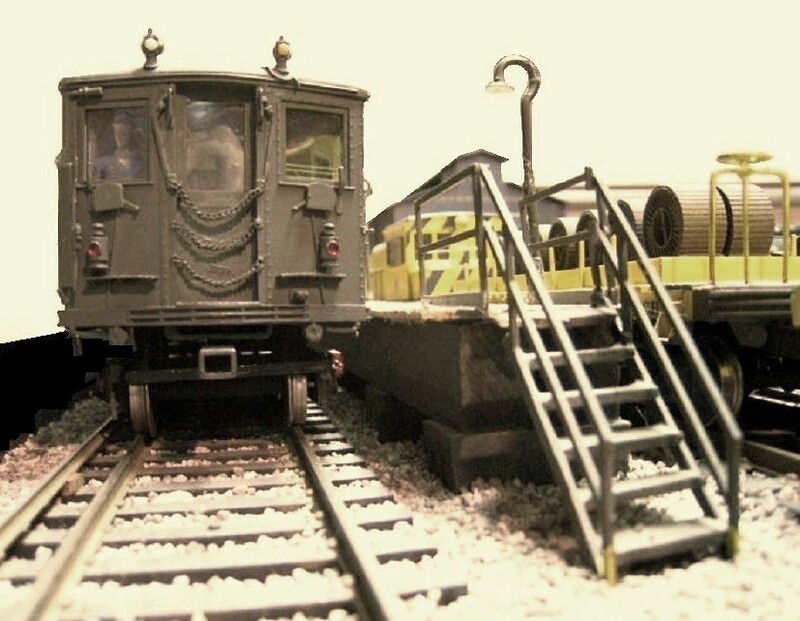 End of local station platform head-on view of an IRT "Deck Roof" High-V Motor car with "Manually Operated Door" controls seen at head of Hi-V local train at an EL local station. IRT Steel Deck Roof Hi-V Motor # 3662 seen at head of local train awaiting departure from a Terminal EL Station. 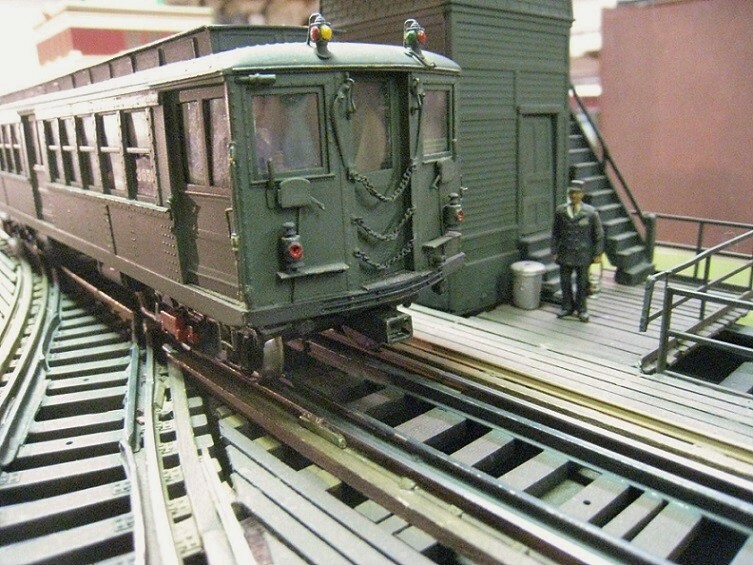 Car # 3662 preserved at Branford Trolley Museum, Conn. A Work Train sits on opposite track across the island platform. 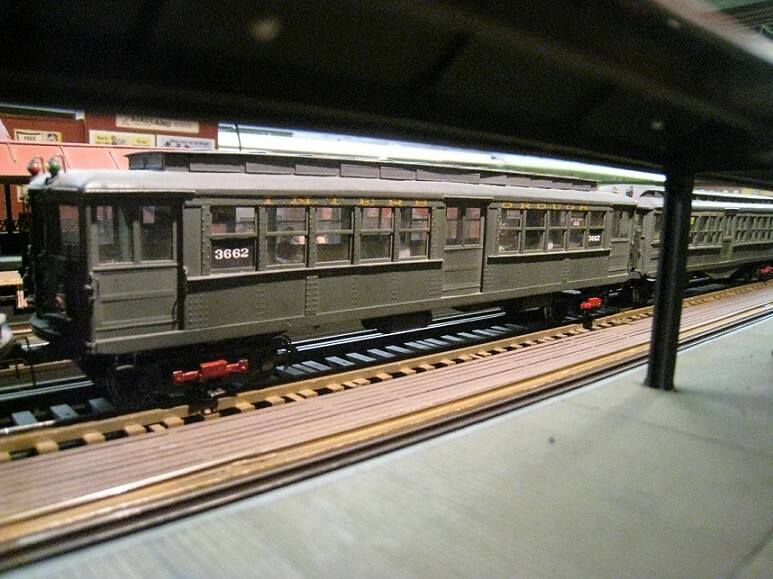 IRT Hi-V Motor Car # 3739 heads a Local train of steel subway cars into a Local Station along the EL. IRT Steel Standard-Body Hi-V Motor # 3739 seen at head of a train awaiting departure at an EL Terminal Station adjacent to the EL Layup yards and repair shops. 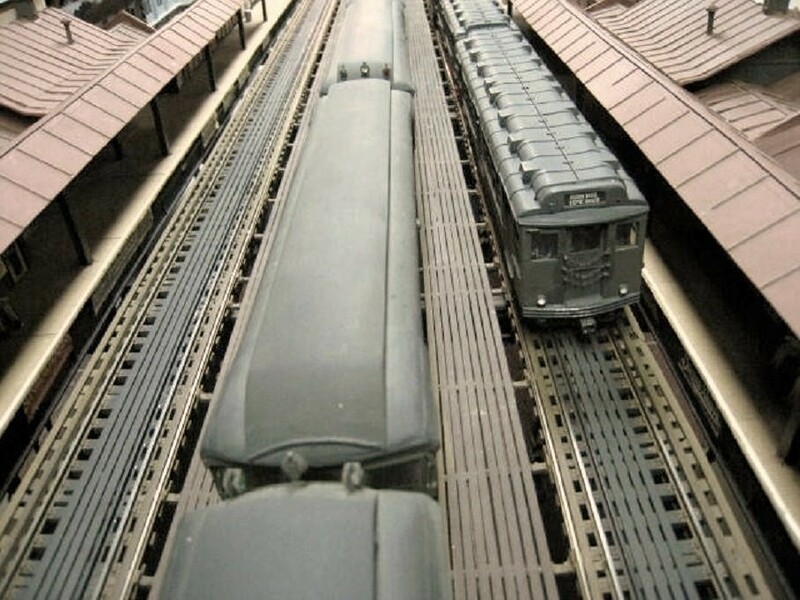 Rooftop view towards an IRT Hi-V MUDC TRAILER car between two IRT Deck Roof Hi-V Motor "Manual Door Control" cars in a Local Train headed for a Local Station on the El. 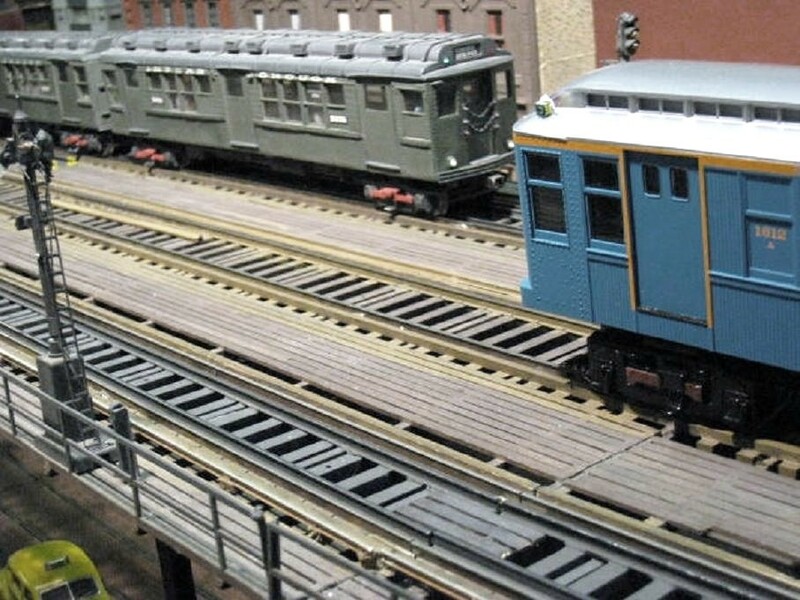 An express train of wooden IRT EL MUDC cars passes by on center express track. 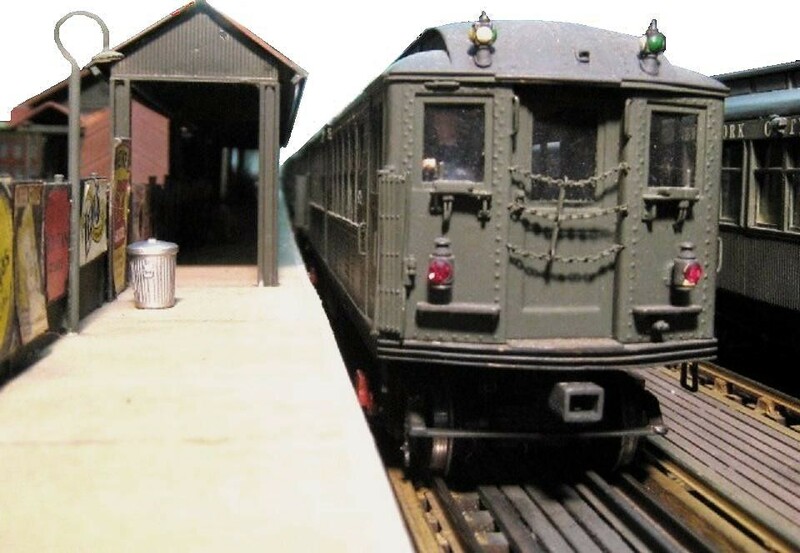 Head on view IRT Hedley Class Hi-V Motor Car at front of train at EL Terminal Station island platform. 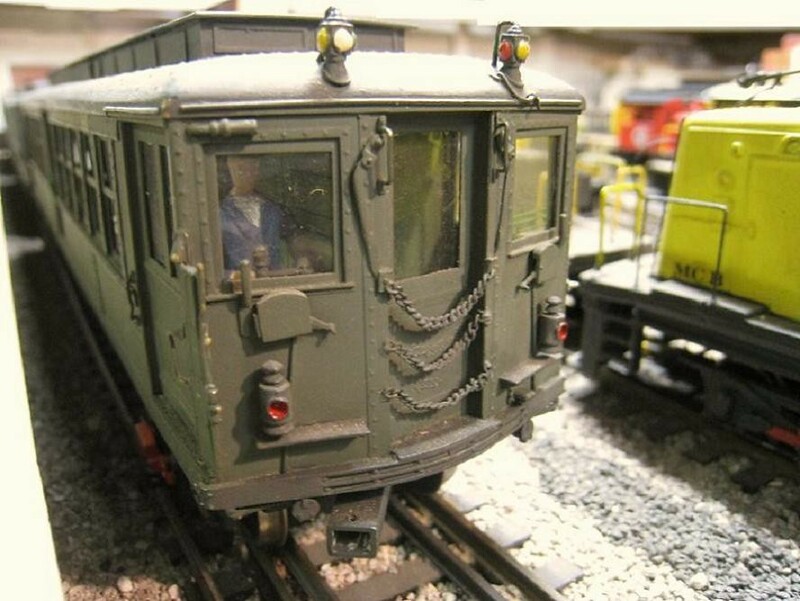 Note the manual hand control door levers on end of carbody. View at end of EL Local Station platform to IRT Low-V Motor rear car of train stopped in station. 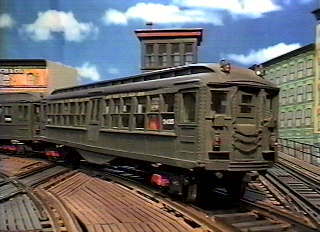 IRT Steel Low-V Subway train seen stopped at a Local Station on the EL, note the motorman in cab front left window of the front Motor car. Looking down along a center island platform Express Station platform, a local train of IRT steel Low-V cars, are seen ready to depart the station. Local Train of steel IRT Low-V cars approaches seen in a rooftop show towards the EL. 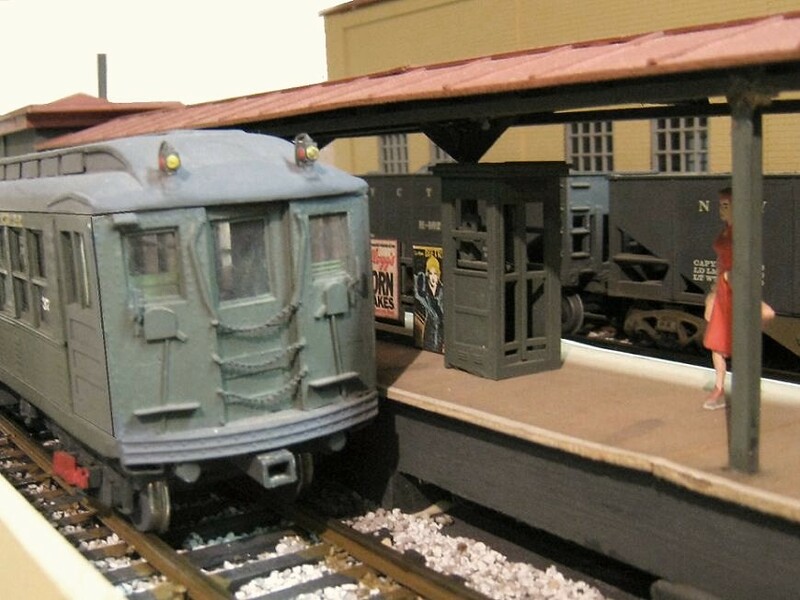 On center Express track is at right is a train of wooden BMT "Q" Type 1939 N.Y. Worlds Fair Cars in WF Colors. 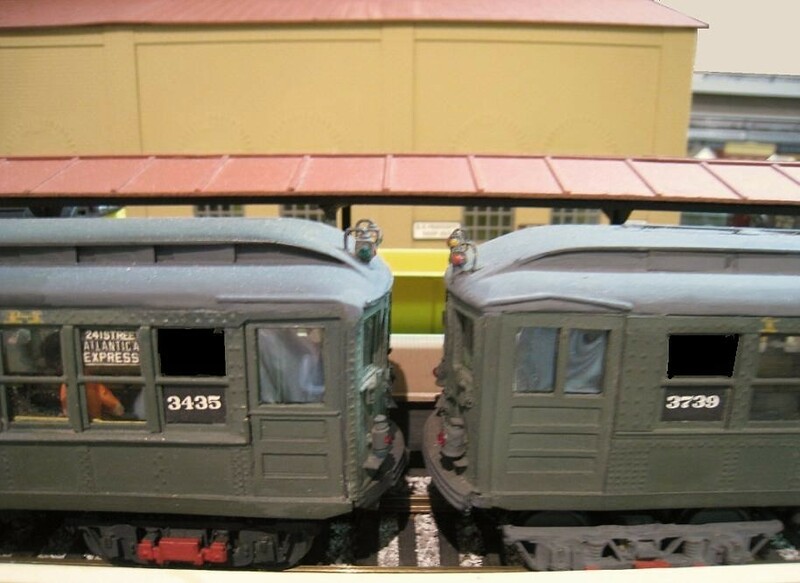 Replicating the joint IRT and BMT services on the then IRT-controlled Flushing & Astoria (Boro of Queens) EL lines until late Oct. 1949. 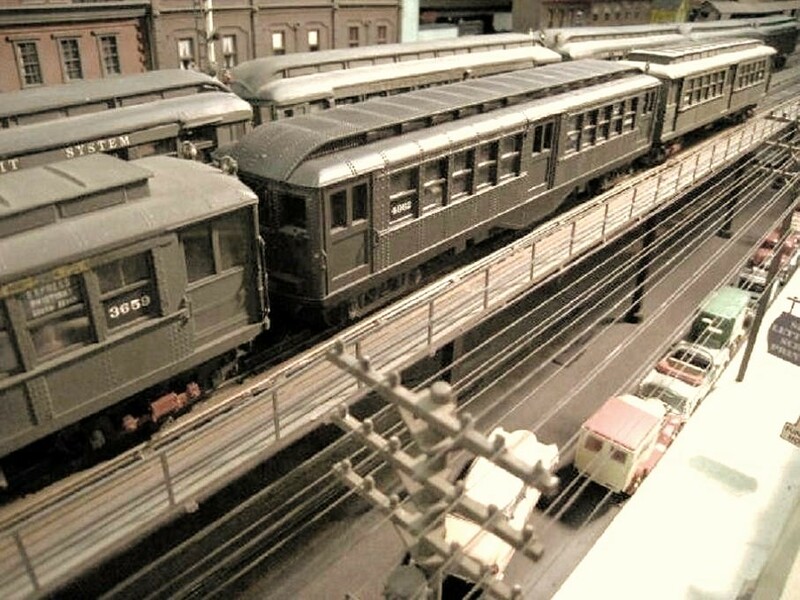 Overhead walkway view of rear car of a Local train of IRT steel "1939 N.Y. Worlds Fair" (Low-V) Motor Steinway cars seen leaving a Local Station on the EL while an Express train of IRT MUDC EL Cars passes by on the center express track. 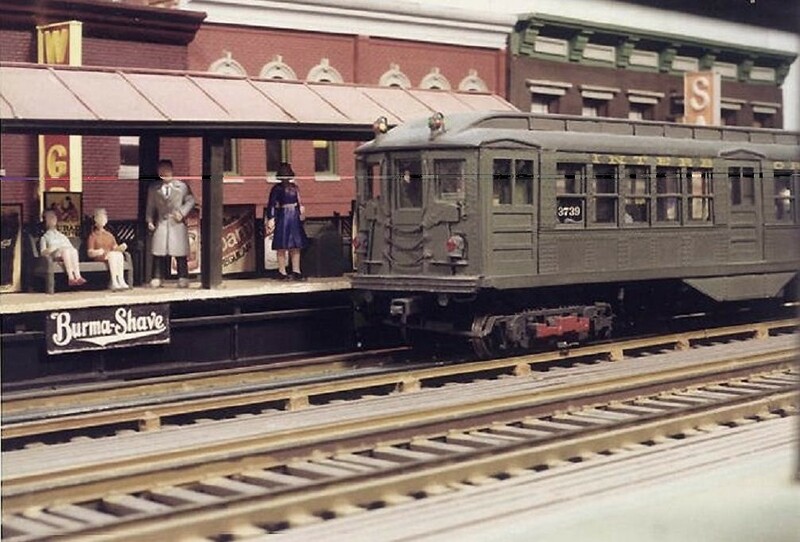 View from Local Station platform to rear car of an IRT 1939 N.Y. Worlds Fair Steinway class Low-V Motor at rear of local at opposite local station platform. An IRT wooden MUDC Elevated Express train approaches on center express track to pass by the station.